Ontario, in east-central Canada and the highest populated province, has reopened 3 streams of the Ontario Immigrant Nominee Program (OINP). These favored streams are the International Masters Graduate Stream, the Human Capital Priorities Stream, and the International Ph.D. Graduate Stream. The Human Capital Priorities Stream which targets foreign skilled workers who meet the criteria for Federal Skilled Worker Class or Canadian Experience Class, last opened in February 2016. It is aligned with the Express Entry system. Applications are not taken directly for this scheme, suitable candidates in the Express Entry pool must first receive a Notification of Interest (NOI). The International Masters Graduate Stream includes only those who have graduated with a Masters degree from an Ontario University and now wish to settle permanently in Ontario. It last opened in May 2016 and has been paused until now. The International Ph.D Graduate scheme is open to those who have graduated from a Ph.D course in Ontario and again was passed last May. All three streams reopened on February 21, 2017, as part of the province’s nomination allocation of 6000 candidates. These three streams will only make up a very small proportion of the provincial nominees. In a press release which gave the news the government of Ontario said the streams will be paused and reopened across the year until the allocation is filled. Another open stream aligned with the federal Express Entry system is the French-Speaking Skilled Worker stream. Again candidates cannot apply for this stream they will receive a Notification of Interest (NOI) from the OINP based on their Express Entry profile and eligibility for the Federal Skilled Worker Program or the Canadian Experience Class. 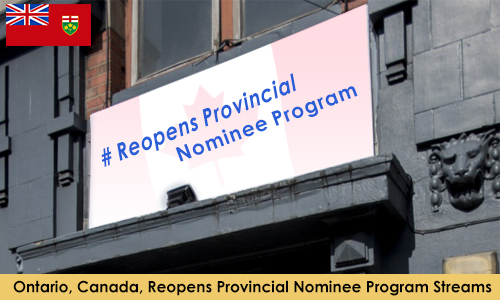 If a candidate receives a Notification of Interest (NOI) from the province via the OINP they are allowed to submit a provincial nomination certificate. If successful they gain 600 points under the Comprehensive Ranking Systems (CRS) for their Express Entry profile. Applicants with a qualifying total amount of points may then receive an Invitation to Apply (ITA) for permanent residency via the Express Entry scheme. More information on these immigration schemes and the full criteria and process for applications which should be understood by interested applicants can be found on the Ontario Immigration.